Since the feed in tariff program stopped, the regulations for grid tie inverters have been changed, that means the inverters are now limited to how much energy they can send back to the public power grid. Whether it is a small photovoltaic system on a domestic roof or a large-scale solar plant of several 100kWs the generated energy is being consumed directly by the appliances on site, only a small amount of energy escapes back to the grid. What happens when nobody is at home and the consumption is of standby devices is negligible ? We end up exporting almost all of the solar generated energy to the national grid. The Distribution Network Operators (DNOs) are right to say that they do not really like to receive back the “unwanted” energy. 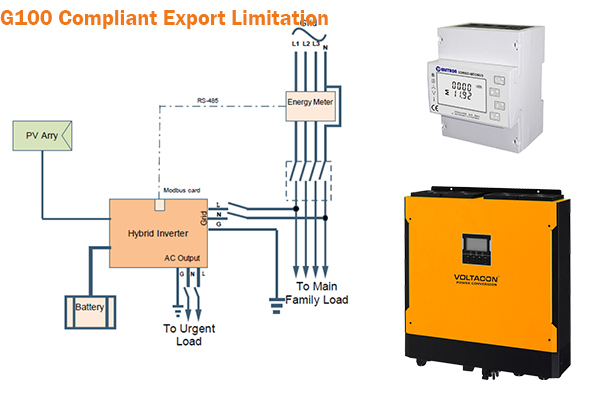 Export Limitation – Control the PV Power that is exported to the electrical grid. G100 simply means that only a pre-determined amount of energy can be exported back to the grid. To avoid any disturbances with the grid, the DNOs do not have to take any actions for the large amount of surplus energy entering the national grid, this is the case on holidays and weekends when the producers of green energy are not at home to make use of it. Voltacon Energy Meter SDM630 with Modbus connection. The meter has an integrated RS485 port hard wired to the following inverters: Voltasol Hybrid Inverter(s) 3kW, 5kW, 5.5kW and 10kW versions. UK DNO’s require a fail-safe operation hard-wired between the components (Inverters, electricity meter and power controller) of the export limiter scheme and specific power quality. REQUIREMENT: The export limitation scheme operates signals to the generation to reduce output within 1 second. The Eastron SDM630 transmits measured values, one averaged value per second to the power controller. The power controller send a new set points to for the AC output power to the inverter. The MPP controller adjusts the power transfer from the panels to the inverter output. If the maximum allowed power has reached the MPP will reduce the production from the PV panels. If the controller or the energy meter fails the export energy will remain to the agreed level or less. REQUIREMENT: When the export limitation scheme operates, it will reduce the exported active power to a value equal to or less than, the agreed export capacity. Power export peaks of typical load steps are limited by the export control circuit within 5 sec. Note: In order to run 0-Watt closed loop control with PV system, it is required to operate a base load (self-consumption) of at least 0.5% of the rated output power of the solar inverter. The energy meter is the power measurement unit and the export limitation is solely calculated by the inverter and communication protocol and no other hardware. Any schematic will therefore not comprise of additional discrete units such as detailed in G100 (Load Control Unit, Interface Unit, Generator Interface Unit or Control Unit). The solar inverter is adjusting the power from the solar panels by controlling the operating points so that the inverter does not generate energy it does not need from the solar PV panels. 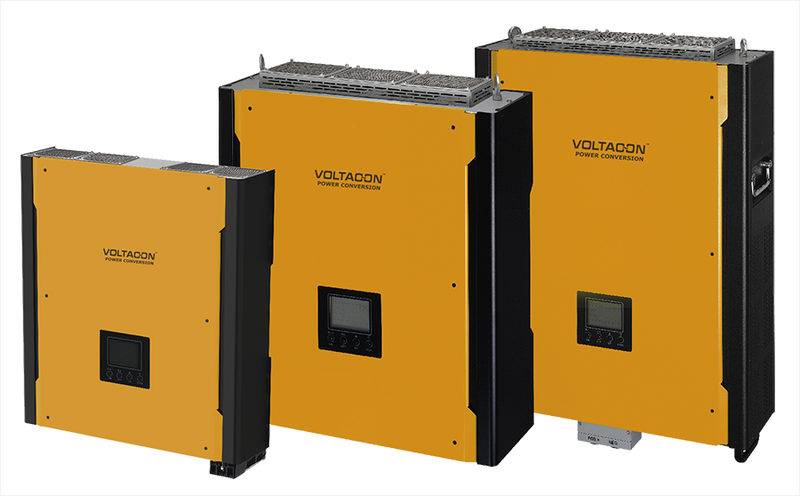 The Voltacon system does not make use of resistive, inductive or any other type of load to dump excessive energy, including water heaters, therefore there are not additional harmonics due to the Exprort Limitation System functioning. The inverter generated harmonics are stated in the respective G83/G59 certification. Voltasol range of G100 certified export limitation scheme. Available models 3kW, 5kW, 5.5kW and 10kW. The inverters operate with energy storage at 48V. The most affordable solution for self-consumption and full control of the generated power. Voltasol HSI3000 Plus, 3000Watt single Phase. Voltasol HSI5500 Plus, 5500Watt Single Phase. Voltasol HSI5000 Plus, 5000Watt Single Phase. Voltasolar HSI1000 Plus 10000Watt Three Phase.